Begin this exercise by jogging in place to warm up your muscles-for 30 seconds. Next, with both feet together and knees slightly bent, jump to the other side of the band by pushing off the balls of your feet. If you don’t have a band, just imagine a square. Quickly jump back to the first side. Continue this motion as fast as you can, jumping from side to side over the band. Also, while keeping your arms basically at a 90° angle with your hands comfortably in front of your body (imagine you’re holding a ski pole in each hand and you’re a mogul skier racing in the Olympics), allow your hands and arms to move naturally from side to side as you jump back and forth. Jump as fast as you comfortably can for 30 seconds. Keep alternating 30 seconds of moderate jogging in place with 30 seconds of intense Hopscotch Shuffle, for a total of 2-4 minutes. 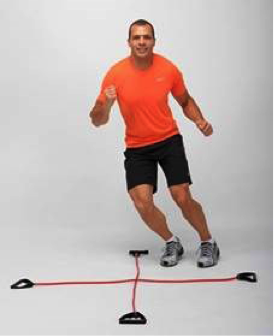 Burst Challenge: “I want to challenge you to perform the “Hopscotch Shuffle” as many times as you can during your day”!